RENO, NV MARCH 24, 2011: Over a dozen vehicles left the Reno Sparks Convention Center for the “Mild to Wild” Fundraiser Trail Ride with all proceeds benefitting the Blue Ribbon Coalitions dedication to keeping our land open for use and protecting responsible recreational access. The day in the dirt was the kick off to a weekend of the Reno Expos including the Reno Off-Road Motorsports Expo, Reno Outdoor Sports & Recreation Expo, the Spring Home & Garden Show, and the Reno Pet Show and Pug Parade. “Blue Ribbon Coalition appreciates every person that came out today to enjoy the land that we all enjoy and help support the fight to protect our daily recreational access,” said Blue Ribbon Coalition representative Del Albright who joined the group in his signature red Jeep. “Our group works everyday to help keep the land open to four wheeling, jet skiing, snowmobiling, rock hounding and just about every other outdoor sport. 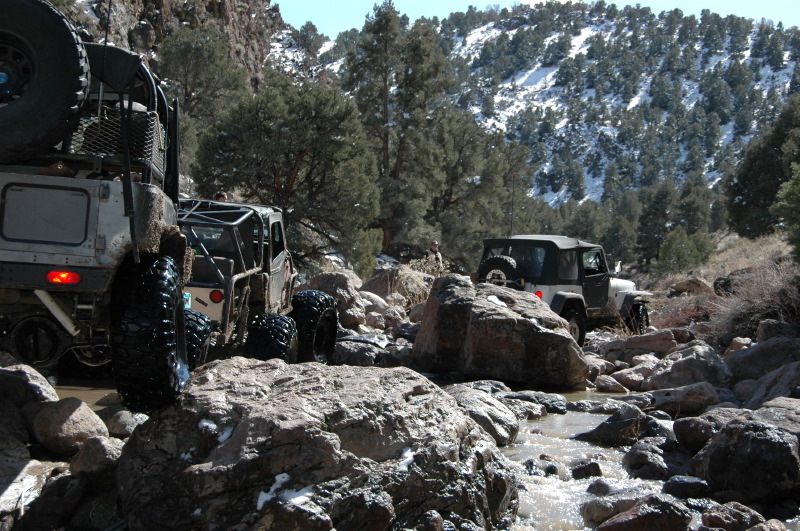 It isn’t just about the dirt sports, it is about all sports and all trails.” Blue Ribbon Coalition will have a booth at the Reno Off-Road Motorsports Expo this weekend where you can learn more and join to become a member. The Reno weather was perfect for a day on the trails. Blue sky, fluffy white clouds and not much wind. With snow the weekend prior, some of the mountain passes were extra muddy, snowy and slippery, but nothing this group of experienced drivers couldn’t handle. A full day led the group to a lookout over Reno, a Petroglyph rock garden, a delightful glance at brand new colts and through one of the hardest rocky canyons known in the area: Bronco Canyon. Normally a dry canyon, the water was deep enough to engulf 33” tires. With the exception of a broken tie rod at the last obstacle, the most challenging rocky section didn’t even phase this group. After a long day on the trail, the now group of friends headed to Virginia City for a bit of social time and story telling about the day. These are the reasons why we love our off-road sport so much. This day of 4 wheeling was the kick-off event to four large shows at the Reno-Sparks Convention Center, Friday through Sunday, March 25-27, 2011. The four show event will feature Ph.D. Antiques Appraiser and part comedian, Dr. Lori, who will give FREE appraisals at the Spring Home & Garden Show; attendees are invited to be a part of the show and bring their antique to Dr. Lori. Splash Dog teams make waves with the fine art of dock jumping and dock diving, and you can even bring your dog to give it a try. Two-time World Motorcycle Trials Champion Tommi Ahvala will take on a giant obstacle course at the Reno Off-Road Motorsports Expo with live performances daily. Bass Tubs of Oklahoma will have their 40 foot mobile aquarium to give fishing demonstrations on bass fishing techniques and the Reno Pet Show brings the ever popular Pug Parade on Sunday, March 27th at 2 p.m.; pug owners are encouraged to register early and enter their best friend online at www.Lockettshows.com. Hear the velvety smooth voice of country singer Joseph Greco and his tribute to country legends, Marty Robbins and Jim Reeves; auditions in search of the next Johnny Cash Tribute Star will take place on stage with Joseph Greco everyday at 2:30pm. Register for an audition online atwww.LockettShows.com.